For about a month, the Rough Fire has been burning uncontrolled just over the mountains from us. We’ve been lucky as the smoke from the fire has been barely noticeable in Bishop — until last night. When we took the dogs out at dusk yesterday, it smelled like every person in Bishop had a campfire going. Everywhere you turned, there was a light fog of smoke. So we hunkered down inside our RV. This morning it was much better, but the Rough Fire is at about 60,000 acres and only 25% controlled. The Burning Man Festival starts soon (August 30 – September 7) and is held in the Black Rock Desert north of Reno. We’ve had a few people stay at the campground on their way to the festival. Holy Dashiki, Batman, it was like 1968 again. Ok… I’m going to bite… what is a “Burning Man” Festival? I also can not imagine the fires and/or smoke. Scary stuff for sure. I put a link it for it. D & I took a drive up the coast….up to Or WA border and then along the Snake River…..lots of smoke in the area in OR and WA…..not good. BUT, sites were wonderful and so were the people we met along the way. Just for once I’d like the prevailing winds to shift from West to East to East to West so LA would get the smoke from the Rough Fire. If that happened, I’ll bet that fire would be out in hours. I had no idea that you were on the doorstep of Burning Man. A friend of ours went a couple of years ago and raved about it. Are you going to drop by? 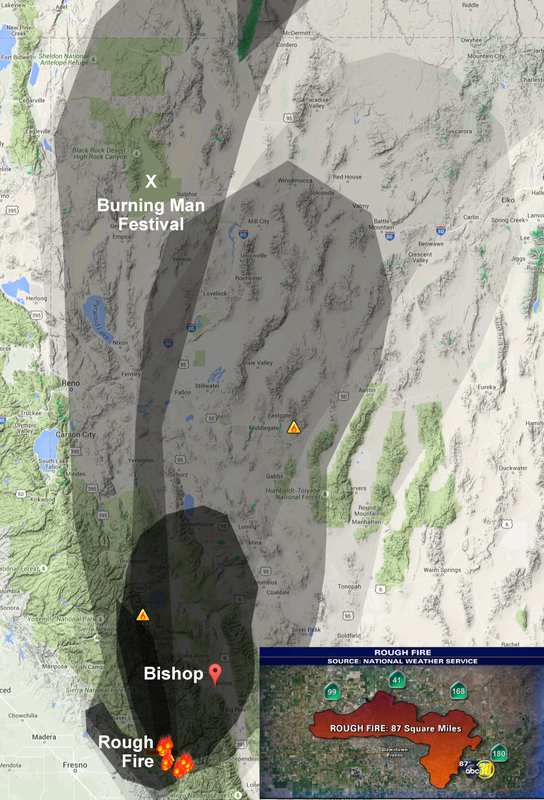 Since it’s about a 6-hour trip to Burning Man, we probably won’t get there. A couple stopped here on the way to Burning Mam. She said tickets are extremely hard to get if you haven’t been before and may cost $900 a person. They are limiting the size of the crowd this year to 70,000. Last year 80,000 was too big.